I’m always on the prowl for good comics, so when Mike Luoma posted on a creative forum that he was seeking reviews of his book I decided to take a peek. 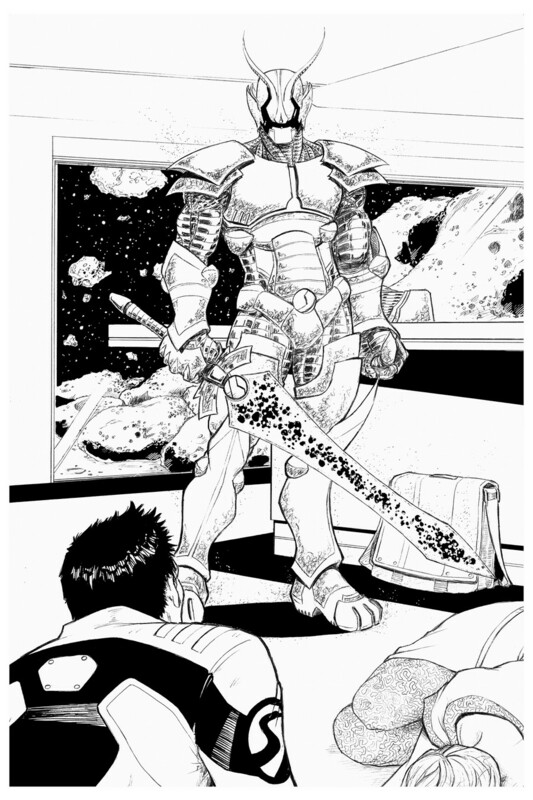 The 43 page digital comic contains three space-opera style stories featuring the titular hero, Alibi Jones. In the first, and best, of the three tales, we meet Alibi Jones. He’s an adventurous young political mediator, who has just successfully brokered a trade deal between two alien races, the creepy Flaze and the cat-like Dakhur. He’s about to zoom back to his home planet, Cat’s Eye, via Transpace Jump Drive when he receives an incoming call from his aunt Anita, (the former Prime Representative of the Solar Alliance). Anita presses Alibi into attending a diplomatic party on Cat’s Eye. While glad-handing the local diplomatic set, Alibi meets up with some questionable characters, including Georgia McGregory, the director of an unknown planet named Poyas. Georgia is in the company of Alibi’s apparently bi-sexual ex-girlfriend Shirra. 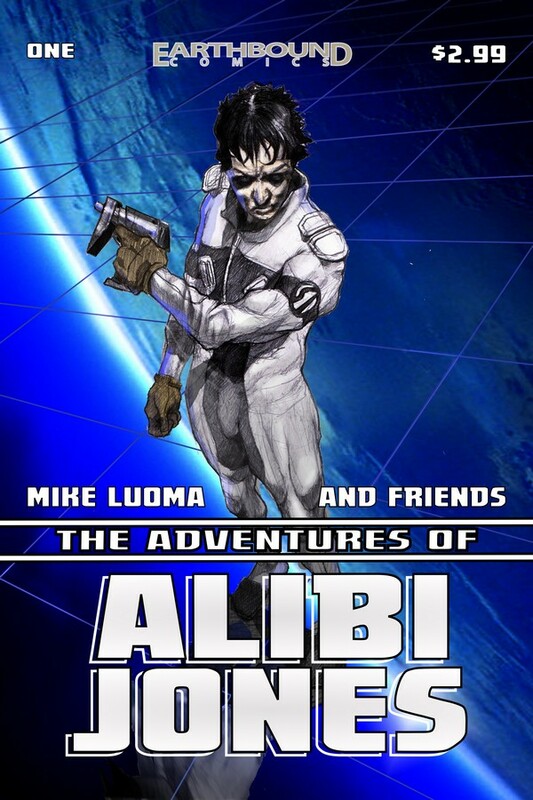 Later, compelled to track down his ex, Alibi gets caught up in an interplanetary scam and falls into a world of hurt. The art, by Meisha, is quite charming, a westernized Manga style, with reasonably solid anatomy, posing and character expressions. The storytelling is clear and readable, and often exciting. The characters are nicely designed and easily recognizable. The pages seem to be reproduced from the pencils with some blacks, inked or added digitally, here and there for contrast. Though I feel the art might benefit from a nice, slick inker, the pencil outlines are quite thick and dark, with appealing graphite softness. As is often the case with science fiction and fantasy, there is a lot of setup at the beginning to establish the fictional world, and there are also a lot of characters to keep straight. Fortunately, the action kicks in before the exposition becomes tedious, and carries the reader through to the cliffhanger ending. There are then a few sweet pinups tossed in, drawn by talented cover artist Federico Guillen. Nice dynamic pencil renderings to cleanse our palate before the next story. 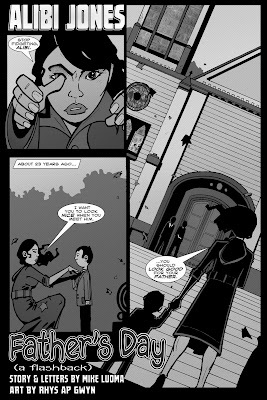 The second story features a more graphic, cartoony, style of illustration by Rhys Ap Gwyn. It’s a flashback from Alibi Jones’s childhood. Alibi’s mother drags him into some sort of church where they meet with a man named Bernard Campion, AKA the “Prime Representative”. She introduces him as Alibi’s father and then things get violent in a hurry. While this is a dramatic little vignette, the story raises more questions than it answers. That’s okay, I suppose, and I imagine we’ll discover more about Alibi’s past in upcoming issues. However, I felt that further clarification was needed here to better lay the groundwork for future installments. The art has an appealing Film Noir flavor, as does the story, but it’s a bit difficult to reconcile this grim scene with the seemingly lighthearted nature of the older Alibi Jones from the first story. I believe this kind of trauma in one’s formative years would lead to a more troubled, conflicted adult. The third story is, in my opinion, the weakest of the three. While the art, again by Meisha, is still quite good, he has rendered much thinner line-weights. This gives the art a sort of anemic, incomplete feeling. If I was vaguely missing a hard ink line on the first story, I was absolutely craving it here. This difference in execution may be due to deadline concerns, I don’t know, but it seemed a little wispy and unfinished. has a less solid, sketchier feeling. However, the greater disappointment here is in the story itself. The first story really felt like the setup of the tale and I fully expected the next story to pick up right where the first one left off. Instead we jump four years ahead and leave a lot of plot threads hanging. Shirra is back again, lamenting the death of her villainous girlfriend Georgia, and packing a stolen time-travel device built by a mysterious race of aliens called the Devrizium. Shirra wants to use the device to go back in time to save Georgia, and, while she’s there, use her knowledge of the future to make a space-cruiser full of cash. Inevitably, a time traveling Devrizium warrior shows up and everything goes to hell. The story is okay as a stand-alone bit of Lee/Kirby style space-fun, but the first story in the book was more measured, better paced, and dramatically superior. Unfortunately, all the interesting possibilities, like how Alibi saved the day, how Georgia reacted when her dangerous scam got foiled, what happened between Georgia and Shirra, are just left hanging in the air. Mike went ahead and jumped over a ton of exciting stuff! The overall package here is pretty good. It’s readable, and fun, and the art is solid. What I’d say is that this is a nearly professional package. But, I’d also say it’s worth checking out to see how the talents here develop in future issues. Born in Cordoba, Argentina in 1990, Artist Federico Guillen started drawing when he was 5 years old. He recently lived in France for seven years before returning to Buenos Aires, working with French film directors in storyboarding and with video game designers as a concept artist. He has also worked with writers from the United States, drawing and publishing comics in that country - most recently Good Samaritan: Unto Dust, written by Mike Luoma. Federico also breakdances in musical comedy shows and plays piano in a hotel restaurant. Meisha has penciled comic stories that have appeared in Earthbound's "The Adventures of Alibi Jones" & "SPACE BOUND! DOUBLE FEATURE", and Twilight Star Productions' "Pandemonium Spotlight". Looking to expand his range, Meisha is interested in drawing various genres. Meisha resides in Tokyo, and finds speaking in the 3rd person awkward. Rhys ap Gwyn was born in Cardiff, Wales. A passionate interest in comic books and comic art drove him to move to break into the industry. 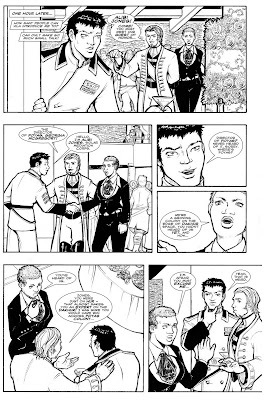 Rhys first had a story published in an anthology published by 360 Comics. 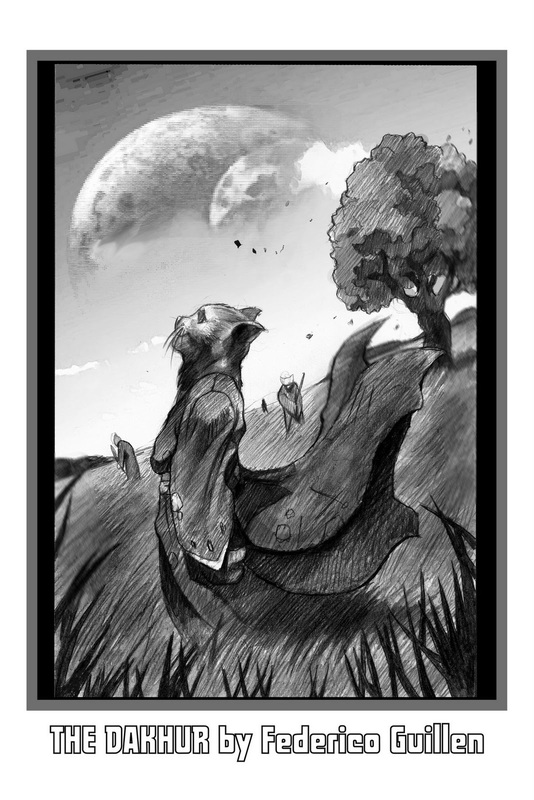 Subsequently, he moved to Australia and formed Monkey Rabbit Studios with Jin Chan, working to self publish a number of creator owned comic book titles. He has since worked on children’s books, television adverts and is currently working on an animated television series, a comedy series and two graphic novel projects. He currently resides in Johannesburg, South Africa.